The internal anatomy of each and every tooth can be highly variable. 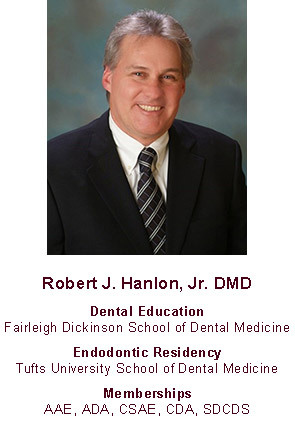 Over the past 25 plus years, Dr. Hanlon has completed endodontic treatment on close to 20,000 individual teeth. It is crucial that we as endodontists work in conjunction not only with your general dentist but with other specialist and even physicians that may be involved in your care. “At Escondido Endodontics we strive to be an extension of your general dentist’s office. Communication is the key to that relationship. We are able to rapidly exchange information with other offices regarding patient care via the internet. We are never hesitant to pick up the telephone to discuss your case with other practitioners”. Many of our patients arrive at our office in pain with swelling. They are often tired from lack of sleep, irritable, and often anxious. Dr. Hanlon is a Past-President of the San Diego County Dental Society, Past-Chair of the Government Affairs Council of the California Dental Association, and current Chair of the California Dental Political Action Committee. “I spend a significant of time each year in both Sacramento and Washington D.C. advocating not only on behalf of the dental profession, but on behalf of patients’ rights. In this uncertain time of the implementation of the Affordable Care Act, you have to be actively involved to not only protect the profession but to advocate on behalf of the patient and their protection as well”.